Between the years 1911 and 1917 a Belgian physician by the name of Fernand Buckens, in this capacity hired by the Chinese Railroad Company that built the Beijing-Hankou line in coöperation with Belgian engineers, spent considerable time unearthing and documenting a number of tombs of the Hou Han period in Northern China. Settled in Zhengzhou in the Henan-province Buckens supervised a section of the Beijing-Hankou line, more specifically the line that starts at Zhengzhou and ends at Xian. In 1909 China nationalized all railroads that were built by foreign companies, and it seems that the Zhengzhou-Xian line had the honour to be the first as it was already partly state-owned. Halfway this line is the ancient capital of Northern China, Luoyang, near the river Luo (called Lo Ho in pre-revolutionary days). Luoyang has been one of the most important places for Buddhism entering China. Here we find the Baima Sze, the tempel of the White Horse that carried the first Buddhist text on his back to China, the Sutra in 42 Sections. 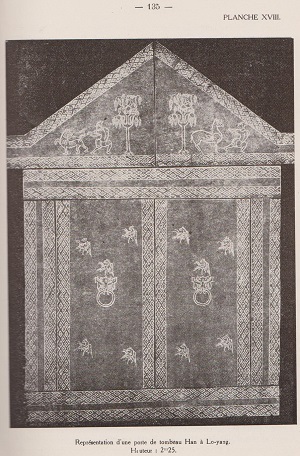 Some of the late Han tombs –- according to Fernand Buckens’ estimation dating from the first upto and including the fourth century –- show characteristics that reveal Amidist Buddhist influences. Amidism or Jingtu has for a long time been the step-child of western studies into Buddhism; we come across many studies into the manuscripts found at the “library” in the Mogao caves and at Gilgit, a western region that centuries ago lived under the influence of Chinese garrisons, but for a long time little attention has been given to the three scriptures woven around the character of Amitábha Buddha, Omitofo in Chinese. The Japanese could have been the first to give scholarly attention to these Sutras, but in China the Amidist teachings were for a long time put into practice though not subject to linguistic studies or otherwise. Those scriptures are the Larger Sutra on Amitayus, also called the Sutra on the Buddha of Infinite Life or the Sukhávati vyúha in Hybrid Sanskrit, the Smaller Sutra on Amitayus, also known as the Smaller Sukhávatí vyúha, and the Sutra on contemplation of Amitayus, in equally Hybrid Sanskrit the Amitáyurdhyána Sutra, in Chinese the Guan wu-liang-shou jing. Although familiar with the main principles of Buddhism, studies that he conducted with Édouard Chavannes’ (1865-1918) publications at hand, as well as those of others, for instance publications by the hand of Léon Wieger SJ (1856- Xi’an 1933), Fernand Buckens resorted solely to the Confucianist Liji (The Book of Rites ) and Yi Li (Etiquette and Rites). Generally speaking this approach has proven to be correct. In these scriptures one finds the rules and regulations concerning the gifts that should accompany the dead, and how they ought to be offered. Nevertheless, with the advent of Buddhism in the early years of the Christian era these regulations were to be enhanced and embellished, and those who enhanced them found justification in certain passages in specifically the Smaller Sukhávatí vyúha, which is the text Amidist temple-societies recite twice-a-day. The following is an attempt to prove that a certain layer of the first to fourth century Hou Han society in and around Luoyang recognised parts of ancient burial rites, or rather the rationale behind them in certain passages of the Smaller Sukhávatí vyúha. That is to say, they had a “they (these Buddhists) too do these things, you know” attitude, a state of mind that invariably leads to a strengthening and celebrating of what is already there. First there is the offering of food to the dead (Buckens, pp 81/2, 92). This Confucian custom, delineated in the Liji, found justification in the above-mentioned Buddhist Sutra. In this Sutra it is said that the Land of Utmost Joy (Sukhávatí), is the place where the deceased go to in order to be able to listen to Buddha’s sermons, and from where they offer sacks of “wonderful flowers” to “millions of Buddhas in other localities”. The text goes on saying that “at mealtime they return to their own country to eat and stroll”. Very early in his years in China Buckens turned into a thorough archaeologist and anthropologist. In his archeological surveys he tried to understand what he encountered at the hand of wat a Sinologist like J.J.M. De Groot  and others put to writing. These observations lead us, readers of the 21rst Century, to the conclusion that the Hou Han-gentry that had amassed sufficient wealth to lay their deceased to rest in larger stone tombs, considered these deceased as having passed into Amitábha Buddha’s Land of Utmost Joy (Sukhávatí) where one is able, so we read, to cultivate with the ultimate goal of Buddhahood. Both the Confucianist Books of Rites and Etiquette specify the implements to be given to the dead in order to provide their spirits with feelings of ease and comfort in their new environment. This notion came to be fortified by the Smaller Sukhávatí vyúha’s above-mentioned passage where the dwellers in Buddha’s Land of Utmost Joy daily return to “their own country” where they “eat their own kitchen” as the Chinese saying goes. The newly converted Buddhists gladly complied with the Confucianist rule of offering “the five types of grains”, being wheat, rice, beans, and two types of millet, and justified this by referring to this Smaller Sukhávatí vyúha’s passage: this is how we did it in the past, and this is how Buddhists do it in the present. We should not think that mourners offered the deceased food on a daily basis; Buckens points to the ritualised format in which the offerings were made: miniature pots, miniature furnaces, horses, straw attendants and spoons sufficed. The intention counted – which is in accordance with Buddhist teachings. Hence the offering to the dead, performed by family-members in Chinese temples are restricted to ceremonies once or twice a year, on anniversaries and on specific holy days. The more or less informed Hou Han-population perhaps ill-understood the Amidist notion of an afterlife, or an existence, or a mental realisation in Buddha’s Land of Utmost Joy. And because they presumably enthousiastically took to this ill-understood and flabbergastingly new interpretion of nirvana or enlightenment this society anchored itself in this pre-Buddhist concept of the chen (spirit) and applied it to the dweller in Sukhávatí. Chen is a concept that is intimately linked with that of “conscious breath”. And “conscious breath” is identified as the qi (chi), the active principle of life. Another one of Buckens’ remarks (p.88) points into the direction of the Himalayan (Tibetan) notion of the in-between, the bardo. Buckens presumes that the guardians that watched over the entrance of the tomb, watched over a “brother of the clan” who presumably had fallen asleep and could very well wake up one day. Here Buckens made an error of judgement, but it allows us to suggest that the pre-Buddhist ghost-warrior outside the tomb eventually came to be identified as a guardian angel, more specifically the Chinese-Buddhist Wei-To who would interfere in case of disturbance of either the cultivation in Sukhávatí, or of the disturbance of the deceased in bardo, that is, on his subconscious way to another life. Here too the ancient pre-Buddhist concepts were not laid to rest but came to be enhanced and embellished by Buddhist notions, whether or not these notions were well understood. The conclusion of all this is that the Chinese — the Americans of the East as far as adapting and reshaping goes — for a long time never really left the old beliefs behind, but fortified them by adding and redefining new Buddhist notions. Suffice it to say that as time went by the newly aquired knowledge of the Buddhist lore gained the upperhand. The 7th Century Buddhist Amidist monk Shandao has been one of the first to lead the population back to the three mentioned Amidist sutras without resorting to ancient concepts of chen or guardian angels. However, since Shandao stressed the assured rebirth in Sukhávatí áfter this life on earth many a monk and nun who suffered hardship in Xian (Chang-an), those day the capital of northern China, hastened to his or her death. As a result Shandao’s stress on deliverance only after death became a burden to society and gradually came to be replaced by the notion of “Pure Land in this Life”: if the mind is pure, the Land is pure.